One of the side effects of having free range chickens is that from time to time they will decide to engage in a little off piste laying. It’s not a major deal obviously, but you might find yourself wondering why your egg count has suddenly decreased. Such was the case for us recently. We have been getting one to two eggs from four hens that usually lay 3-4. 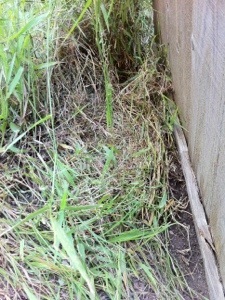 After checking all the usual hiding places and finding nothing, I put it down to the recent heat. But today I happened upon 7 eggs stashed behind an old gate. In such circumstances you need a method of checking whether the eggs are still fresh. I remembered one I had heard about once which was to place the egg in a deep bowl of cold water – if it sinks, it’s fresh. If it floats it isn’t – something to do with the bacteria producing gas within the shell. I quickly tested them all and found they were fresh. Lovely, plenty of eggs for breakfast tomorrow. 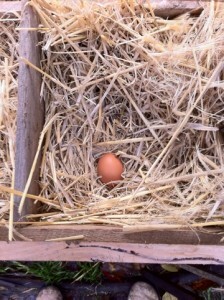 Our first egg nestled in the straw. Today we got our first egg from our chickens. If you have been following this blog you will know that I have been writing about getting set up for our chickens. My posts are a bit behind the reality and I haven’t gone into which hens we chose or why, but I just wanted to highlight this milestone. If the chickens keep this up we might just have enough for breakfast by the weekend!